This map shows which candidate is leading in the most recent opinion polling for each state. Note: This map reflects the latest opinion polling results, NOT the final actual result of the primaries/caucuses themselves. A map of the primaries' results is located at File:Democratic Party presidential primaries results, 2016.svg. This article contains opinion polling by U.S. state for the 2016 Democratic Party presidential primaries. For currency and accuracy, please note the specific dates for each polling as listed below. 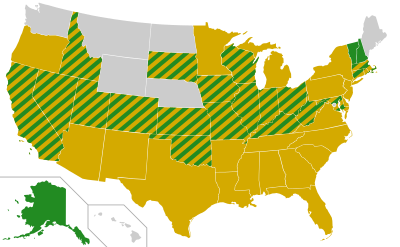 For the significance of the earliest state votes, the Iowa caucuses and the New Hampshire primary, see United States presidential primary – Iowa and New Hampshire. To know when any given state votes, see the timeline of primaries and caucuses. No polls were conducted for the Wyoming Democratic caucuses. ^ "Alabama and Oklahoma: Trump Leads in Both, Clinton Leads in Al, Sanders in OK" (PDF). ^ Albrecht, Peter (12 August 2015). "Alabama Republicans Favor Trump By Wide Margin". wkrg.com. ^ a b "ADN poll: Alaskans like Trump, Sanders for president". 23 January 2016. ^ "New Arizona poll: Trump, Clinton lead but ample undecideds". March 15, 2016. Retrieved March 15, 2016. ^ "Clinton dusting Sanders in Arizona poll". February 29, 2016. ^ "Hillary Clinton Bests Bernie Sanders in Test Presidential Election by 47% to 19%" (PDF). November 19, 2015. ^ "Arizona Polling Results" (PDF). One America News. Retrieved 2015-08-20. ^ "Clinton Closely Matched With Most Republicans in Arizona" (PDF). Publicpolicypolling.com. Retrieved 2015-07-11. ^ "Poll: Hillary Clinton, Ted Cruz hold leads in Democratic, GOP Presidential primaries". Retrieved February 7, 2016. ^ "Arkansas September Toplines" (PDF). Suffolk.edu. Retrieved 2015-07-11. ^ Goodman, Alana. "Tom Cotton in Dead Heat with Mark Pryor for Arkansas Senate". The Washington Free Beacon. ^ "Poll: Hillary Clinton, Bernie Sanders down to the wire in California". www.cbsnews.com. Retrieved 2016-06-07. ^ "California 2016 Primary Forecasts". ARG. Retrieved June 7, 2016. ^ "NBC News/WSJ/Marist Poll June 2016 California Questionnaire". scribd.com. Retrieved June 1, 2016. ^ "California's Democratic Presidential Primary Tightening. Clinton's Lead Over Sanders Declines to Two Points. State Republicans Appear to Be Warming to Trump's Candidacy". Retrieved June 2, 2016. ^ "NBC News/WSJ/Marist Poll June 2016 California Questionnaire". scribd.com. Retrieved June 3, 2016. ^ "Hillary Clinton poised to defeat Bernie Sanders in California's presidential primary, SurveyUSA poll shows". ABC News. Retrieved 23 May 2016. ^ "Californians and Their Government May 2016 Full Crosstabs – Likely Voters Only" (PDF). PPIC Statewide Survey. Retrieved 26 May 2016. ^ "Poll: Clinton up 13 over Sanders in Calif". Retrieved May 31, 2016. ^ "Capitol Weekly California Statewide Dem Primary April 28-May 1, 2016" (PDF). Retrieved May 4, 2016. ^ "California voters resigned to vote for Donald Trump vs. Hillary Clinton, SurveyUSA poll shows". Retrieved May 2, 2016. ^ "Fox News Poll: California Presidential Primaries". Fox News. April 22, 2016. Retrieved April 22, 2016. ^ "Poll: Clinton keeps New York edge, leads Sanders in California". Retrieved 2016-04-17. ^ "California Democratic Primary Polling". Retrieved 2016-04-20. ^ "Sanders gaining on Clinton in California poll". Retrieved 2016-04-08. ^ In CA, 47% of Registered Voters and 15% of Likely GOP Primary Voters Have 'Extremely Negative' View of Trump; Still He Leads Cruz Narrowly; Clinton Atop Sanders in Democrat Primary; Harris & Sanchez Likely To Advance for Boxer's Seat; CA's Vital 55 Electoral Votes Stay Blue in 2016: (Report). SurveyUSA. 2016-04-05. Retrieved 2016-04-05. ^ "As California primary nears, even Sanders supporters are uniting behind Clinton and against a common enemy: Trump". Retrieved 2016-03-29. ^ "Californians and Their Government - March 2016 Full Crosstabs - Likely Voters Only" (PDF). Retrieved 2016-03-24. ^ DiCamillo, Mark (6 January 2016). "Clinton Maintains 11-Point Lead Over Sanders Among Likely Voters in California's Democratic Presidential Primary. Both Candidates Are Highly Regarded" (PDF). Field Research Corporation. Archived (PDF) from the original on 2016-01-16. Retrieved 22 January 2016. ^ "Sanders gains on Clinton". sacbee.com. Retrieved 2015-10-07. ^ "Trump and Clinton lead presidential contenders in California". news.usc.edu/. Retrieved 2015-09-13. ^ "Field Poll Online" (PDF). field.com. Archived from the original (PDF) on 2015-05-28. Retrieved 2015-07-09. ^ "2016 California Presidential Republican Primary – Bush 17%, Walker 17%". Emerson College. Retrieved 22 January 2016. ^ "Free Beacon Poll: Sanders Overtakes Clinton in Colorado". ^ "Suffolk" (PDF). suffolk.edu. Retrieved 2015-07-09. ^ a b c "Clinton, Sanders close in CT/PA/RI; Trump Headed for Big Wins" (PDF). Public Policy Polling. April 25, 2016. Retrieved April 25, 2016. ^ "TRUMP LEADS, KASICH TOPS CRUZ IN CONNECTICUT GOP RACE, QUINNIPIAC UNIVERSITY POLL FINDS; WOMEN, BLACKS GIVE CLINTON LEAD AMONG DEMOCRATS" (PDF). Retrieved 2016-04-20. ^ "TRUMP COULD SWEEP CONNECTICUT; SANDERS IN STRIKING DISTANCE; KASICH BEATS BERNIE, HILLARY" (PDF). Retrieved 2016-04-12. ^ "Emerson College Poll" (PDF). Emerson College Polling Society. Retrieved 2015-11-18. ^ "Release Detail". Quinnipiac University. Retrieved 2015-10-13. ^ "Release Detail". Quinnipiac University. Retrieved 2015-07-09. ^ "ARG Florida Poll March 11-13, 2016". ^ "March 14, 2016 - Trump Tops Rubio In Florida, Ties Kasich In Ohio, Quinnipiac University Poll Finds; Clinton Leads Sanders In Two Critical Primaries". ^ "Midwestern States a Toss Up Tuesday" (PDF). ^ "Poll: Trump and Kasich neck-and-neck in Ohio; Trump leads in Florida". ^ "Poll: Marco Rubio, Ted Cruz split anti-Donald Trump vote in Florida". ^ "Polls: Trump Ahead in Florida, Illinois; Kasich Leads in Ohio". ^ "Poll: Rubio closing in on Trump in Florida". ^ a b "WOMEN DRIVE CLINTON TO 2-1 LEAD AMONG FLORIDA DEMS, QUINNIPIAC UNIVERSITY POLL FINDS; SHE HAS 9-POINT LEAD IN OHIO" (PDF). ^ "Exclusive Florida Decides Poll: Trump, Clinton lead Florida's presidential primaries". ^ "CNN/ORC Poll: Trump, Clinton leading in Florida, Ohio". ^ "Washington Post-Univision News Florida Democratic primary survey March 2016". The Washington Post. Retrieved March 10, 2016. ^ "Minority voters help Clinton dominate Sanders in Florida poll". Politico Florida. Retrieved February 29, 2016. ^ "Trump Leads Rubio in Florida- Even Head to Head" (PDF). Public Polling Policy. Retrieved February 26, 2016. ^ "Florida Polling Results". One America News Network. Retrieved March 5, 2016. ^ "WOMEN GIVE CLINTON BIG LEAD AMONG FLORIDA DEMOCRATS, QUINNIPIAC UNIVERSITY POLL FINDS; YOUNG VOTERS GO TO SANDERS" (PDF). Quinnipiac. Retrieved February 26, 2016. ^ "The Florida Southern College Center for Polling and Policy Research" (PDF). Quinnipiac University. February 6, 2016. ^ a b "Polls". FAU College of Business. Retrieved 22 January 2016. ^ "Florida Decides Poll: Trump dominates among Florida voters". baynews9.com. ^ "Polling Institute at Saint Leo University – Ben Carson Nearly Ties with Frontrunner Trump Nationally Among Likely GOP Voters, while Jeb Bush Trails, Nationally and in Florida". Polling Institute at Saint Leo University. ^ "2016 Presidential Swing State Polls Poll". Quinnipiac University. October 7, 2015. ^ "Florida Down on Bush, Rubio Campaigns" (PDF). Public Policy Polling. 15 September 2015. ^ "Florida Poll (September 12, 2015)3 (2)". Scribd. ^ "Poll: Hillary Clinton, Donald Trump lead in Florida". Retrieved 2015-09-06. ^ a b c "Quinnipiac poll" (PDF). Quinnipiac.edu. Retrieved 2015-08-20. ^ "Florida Statewide Democratic Primary Election survey" (PDF). Retrieved 2015-07-30. ^ "BUSH TOP CHOICE OF STATE GOP VOTERS RUBIO DROPS, WALKER RUNS 3RD – AHEAD OF TRUMP, CLINTON HAS WIDE LEAD AMONG DEMOCRATS". Retrieved 2015-07-24. ^ "Current Democratic and Republican Polling in Florida – Gravis". Retrieved 2015-07-09. ^ Quinnipiac University. "2016 Presidential Swing State Polls Poll – April 2, 2015 – Bush Slips In Florida, Stalls – Quinnipiac University Connecticut". QU Poll. ^ "Gravis Insights Florida Political Primary Poll Republican and Democrat". Gravis. ^ Quinnipiac University. "2016 Presidential Swing State Polls Poll – – – Quinnipiac University Connecticut". QU Poll. ^ Quinnipiac University. "Florida (FL) Poll – July 24, 2014 – Obama In Slump, But Clinton Sc – Quinnipiac University Connecticut". QU Poll. ^ Quinnipiac University. "Florida (FL) Poll – May 1, 2014 – Jeb Bush Is Top Dog In Florida – Quinnipiac University Connecticut". QU Poll. ^ Quinnipiac University. "Florida (FL) Poll – January 31, 2014 – Bridgegate Drives Christie To – Quinnipiac University Connecticut". QU Poll. ^ Quinnipiac University. "Florida (FL) Poll – November 22, 2013 – Jeb Bush, Clinton Tops In Flor – Quinnipiac University Connecticut". QU Poll. ^ Bernick. "Poll: Trump Leads in Idaho Ahead of Tuesday's Primary". idahopoliticsweekly.com. ^ Bryan. "Idaho Democrats Pick Clinton; Republicans Still Undecided". idahopoliticsweekly.com. ^ "ID Politics Weekly". Idaho Politics Weekly. Retrieved 2015-10-15. ^ "Donald Trump, Jeb Bush Lead GOP Field in Idaho". Idaho Politics Weekly. Retrieved 2015-08-10. ^ Bryan. "Jeb Bush, Hillary Clinton Lead 2016 Presidential Contenders in the Gem State". idahopoliticsweekly.com. ^ "ANALYSIS: 2016 Illinois Democratic Primary" (PDF). ^ "Illinois Democratic Presidential Primary March 8". ^ "Clinton holds commanding lead over Sanders in Illinois". Retrieved 2016-03-08. ^ "Illinois Democratic Presidential Primary". ^ "Simon Poll: Clinton, Trump Lead in Illinois" (PDF). ^ "Poll: Clinton Lead in Illinois Over Sanders Slips". ^ "Poll: Bernie Sanders Gaining On Hillary Clinton In Illinois". ^ "Kirk Unpopular, Trails Duckworth" (PDF). Public Policy Polling. Retrieved 2015-07-29. ^ "American Research Group, Inc". Retrieved 2016-04-29. ^ "NBC News/WSJ/Marist Poll May 2016 Indiana Questionnaire" (PDF). Retrieved 2016-05-02. ^ "1) Cruz Ahead in Indiana 2) Clinton Leads 3) Young Edging Stutzman but Many Yet to Decide" (PDF). Retrieved 2016-04-30. ^ "IPFW poll: Hoosiers like Clinton". Retrieved 2016-04-29. ^ "Poll: Donald Trump, Hillary Clinton lead in Pennsylvania, Indiana". Retrieved 2016-04-24. ^ "Fox News Poll: Indiana Presidential Primaries". Fox News. April 22, 2016. Retrieved April 22, 2016. ^ "Exclusive WTHR/HPI Poll: Trump, Clinton have small leads in Indiana, overall tight race". WTHR News. April 22, 2016. Retrieved April 22, 2016. ^ "TRUMP BY A NOSE OVER CRUZ; RUBIO GAINS MOMENTUM AND CLINTON MAINTAINS LEAD OVER SANDERS" (PDF). Emerson College Polling Society. 1 February 2016. Retrieved 5 February 2016. ^ "FIRST-TIMERS PUT TRUMP AHEAD IN IOWA GOP CAUCUS, QUINNIPIAC UNIVERSITY POLL FINDS; SANDERS NEEDS FIRST-TIMERS TO TIE CLINTON IN DEM CAUCUS" (PDF). Quinnipiac University Poll. 1 February 2016. Retrieved 5 February 2016. ^ Eller, Donnelle; Jacobs, Jennifer (30 January 2016). "Clinton keeps slim edge over Sanders in latest Iowa Poll". The Des Moines Register. Retrieved 5 February 2016. ^ "NBC News/WSJ/Marist Poll" (PDF). MSNBC. 28 January 2016. Retrieved 5 February 2016. ^ "Iowa Polling Results". OAN. Retrieved 5 February 2016. ^ "IOWA: CLINTON CLINGS TO CAUCUS LEAD" (PDF). Monmouth University Poll. 28 January 2016. Retrieved 5 February 2016. ^ "Iowa". American Research Group, Inc. Retrieved 5 February 2016. ^ "Sanders-Clinton Close Race Frozen In Iowa, Quinnipiac University Poll Finds; Men, Very Liberals, Young Voters Back Sanders". Quinnipiac University. Retrieved 2016-01-27. ^ "Clinton, Cruz Lead Among Iowa Caucusgoers in WHO-HD, Iowa State University Poll". WHO TV. 25 January 2016. Retrieved 5 February 2016. ^ "Fox News Poll: Sanders narrows gap in Iowa". Fox News. Retrieved 5 February 2016. ^ Salvanto, Anthony; Backus, Fred; De Pinto, Jennifer; Dutton, Sarah (January 24, 2016). "Poll: Sanders edges Clinton in Iowa, leads big in New Hampshire". CBS News. Retrieved January 24, 2016. ^ Dinan, Conor (21 January 2016). "Emerson Poll: Clinton Ahead Of Sanders In Iowa By 9 Points". Talking Points Memo. Retrieved 22 January 2016. ^ "Iowa CNN/ORC poll: Full results". cnn.com. 21 January 2016. Retrieved 22 January 2016. ^ "Iowa Democratic Caucus Poll Prepared for Monmouth College and KBUR-AM" (PDF). Retrieved 22 January 2016. ^ "Loras College – 2016 – Clinton Maintains Lead, New Loras College Poll Finds". Loras.edu. 2014-12-06. Retrieved 2016-01-23. ^ "Iowa Democratic Presidential Caucus" (PDF). Public Policy Polling. Retrieved 2016-01-12. ^ "Sanders, Clinton Going Down to the Wire, Iowa Poll Shows". Bloomberg. Retrieved 2016-01-14. ^ "Iowa Democratic Presidential Caucus" (PDF). American Research Group. Retrieved 2016-01-11. ^ "Sander Surges In Iowa Democratic Caucus". Quinnipiac University. Retrieved 2016-01-12. ^ Brown, S. Kathi (January 2016). "Likely Iowa Caucus Voters' Attitudes toward Social Security". AARP Research. Retrieved 5 February 2016. ^ "NBC News/WSJ/Marist Poll January 2016 Iowa Questionnaire" (PDF). msnbcmedia.msn.com. Retrieved 2015-01-10. ^ "Gravis Iowa Caucus Republican and Democrat Public Opinion Poll". Gravis Marketing. 23 December 2015. Retrieved 22 January 2016. ^ a b c "CBS News 2016 Battleground Tracker Iowa" (PDF). ^ "Trump Edges Cruz in Iowa; His Supporters Think Japanese Internment Was Good; Clinton Still Well Ahead of Sanders In State". Public Policy Polling. Retrieved 23 December 2015. ^ "Iowa (IA) Poll". QU Poll. December 15, 2015. Retrieved 23 December 2015. ^ "Fox News Poll: Cruz, Clinton lead in Iowa". Fox News. Retrieved 23 December 2015. ^ "Loras College – 2015 – Clinton Remains with Strong Lead, New Loras College Poll Finds". Loras.edu. 2015-12-15. Retrieved 2015-12-27. ^ "Bloomberg Politics/Des Moines Register Iowa Poll". Selzer & Company. December 2015. Retrieved 22 January 2016. ^ a b "Iowa Democratic Presidential Caucus". realclearpolitics.com. Retrieved 2015-12-09. ^ "Iowa (IA) Poll – November 25, 2015 – Clinton Leads Iowa Dem Caucus, | Quinnipiac University Connecticut". Quinnipiac.edu. 2015-11-25. Retrieved 2015-12-27. ^ "Election 2016: Hillary Clinton extends Iowa lead, maintains SC lead, narrows gap in NH". 23 November 2015. ^ "Iowa" (PDF). CNN/ORC. 6 November 2015. Retrieved 22 January 2016. ^ "RCP IA poll" (PDF). November 2, 2015. ^ "Cruz rising in Iowa; Clinton back out to dominant lead" (PDF). November 2, 2015. ^ "KBUR Dem poll" (PDF). ^ "Iowa Democratic Caucus Poll – October, 2015" (PDF). Douglas Fulmer and Associates. October 2015. Retrieved 22 January 2016. ^ "Iowa: Clinton has Huge Caucus Lead" (PDF). Monmouth University Poll. 27 October 2015. Retrieved 22 January 2016. ^ "CBS News 2016 Battleground Tracker Iowa" (PDF). YouGov. Retrieved 22 January 2016. ^ "Iowa Poll: Clinton up by 7, but gap tightens". Des Moines Register. 22 October 2015. ^ "NBC News/WSJ/Marist Poll October 2015 Iowa Questionnaire". Retrieved 2015-10-04. ^ "Trump Continues To Lead in Iowa; Clinton in Good Shape" (PDF). Public Policy Polling. 22 September 2015. Retrieved 22 January 2016. ^ "Bernie Sanders Iowa poll". Retrieved 2015-09-10. ^ "NBC News/Marist Poll – September 2015 – Iowa Questionnaire". Retrieved 2015-09-06. ^ "Clinton Leads but Sanders Gains, Loras College Poll Finds". loras.edu. Retrieved 2015-09-04. ^ "Iowa Poll: Clinton leads, but Sanders draws near". Des Moines Register. 29 August 2015. ^ "Despite email flap, Clinton up in Iowa in Suffolk poll". USA Today. Retrieved 2015-08-26. ^ "CNN/ORC Iowa Poll" (PDF). CNN. Retrieved 2015-08-12. ^ "Trump Still Leads in Iowa; Fiorina on Fire; Paul Tanking" (PDF). Public Policy Polling. Retrieved 2015-08-10. ^ "Iowa Results" (PDF). NBC News/Marist. Retrieved 2015-07-26. ^ "HuffPo Iowa Dem Caucus" (PDF). huffingtonpost.com. Retrieved 2015-07-22. ^ "Quinnipiac poll" (PDF). quinnipiac.edu. Retrieved 2015-07-09. ^ "Donald Trump, Hillary Clinton hold leads in Kansas poll, but many voters are undecided". ^ "Suffolk Kansas Toplines" (PDF). suffolk.edu. Retrieved 2015-07-09. ^ "Kentucky Survey Results" (PDF). publicpolicypolling.com. Retrieved 2016-03-08. ^ "PPP KY" (PDF). publicpolicypolling.com. Retrieved 2015-07-09. ^ "LOUISIANA PRESIDENTIAL PRIMARY SURVEY TOPLINE RESULTS" (PDF). ^ "WWL-TV/Advocate poll: Carson the favorite of state's Republicans". Retrieved 2015-10-16. ^ "Residents' Views on Politics, the Economy, & Issues Facing the State of Maine". Retrieved 2015-10-16. ^ "Maryland poll April 21-24, 2016". American Research Group. Retrieved April 25, 2016. ^ "MARYLAND: CLINTON LEADS SANDERS BY 25" (PDF). Retrieved 2016-04-22. ^ "Maryland Likely To Continue Momentum for Trump, Clinton" (PDF). Retrieved 2016-04-19. ^ "NBC4/Marist Poll April 2016 Maryland Questionnaire" (PDF). Retrieved 2016-04-13. ^ "Washington Post-University of Maryland poll, March 30-April 3, 2016". Retrieved 2016-04-07. ^ "Hillary Clinton has 33-point lead in Maryland Democratic primary, new poll shows". ^ "Goucher poll February 13–18, 2016" (PDF). ^ "Goucher poll September 26 – October 1, 2015" (PDF). ^ "(Among Democrats and independents who lean Democratic) Thinking ahead to 2016, between (Martin O'Malley), (Hillary Clinton), (Joe Biden), (Andrew Cuomo) and (Elizabeth Warren) whom would you like to be the next Democratic presidential nominee?". Washington Post. 2014-02-22. Retrieved 2015-07-09. ^ a b c "Trump's Lead Looks Steady in Run-Up to Super Tuesday". Retrieved 2016-03-01. ^ "EMERSON POLL: CRUZ CLINGS TO NARROW LEAD IN TEXAS; TRUMP ROMPS IN BAY STATE, CLINTON PULLS AWAY FROM SANDERS" (PDF). ^ "FINAL FEBRUARY MASS. DEM LIKELY VOTERS GeoCode" (PDF). ^ "UMass Amherst/WBZ Poll of MA Likely Primary Voters" (PDF). ^ "WBUR Poll: In Mass., Clinton Edges Sanders, While Trump Leads Big". ^ "EMERSON POLL: IN MASSACHUSETTS CLINTON, SANDERS IN A DEAD HEAT; TRUMP TROUNCES ALL GOP RIVALS" (PDF). ^ "March 2016 Democratic Primary Polls" (PDF). ^ "Wix PDF" (PDF). media.wix.com. Retrieved 2015-07-09. ^ "Michigan Democratic Presidential Primary". ^ "Clinton Opens Up Huge Lead in Michigan" (PDF). ^ "MICHIGAN: TRUMP, CLINTON IN FRONT" (PDF). ^ a b "Michigan Democratic Presidential Primary". ^ "Clinton's lead on Sanders shrinks heading into Michigan Primary". ^ "Donald Trump, Hillary Clinton Hold Big Leads in Michigan: Poll". ^ "TRUMP LEADS GOP FIELD IN MICHIGAN; DEMOCRATIC RACE CLOSE". ^ "Clinton, Trump maintain large leads ahead of debates, primary". ^ "Trump & Clinton Poised to Take Michigan" (PDF). ^ "Clinton Leads Sanders by 34% February 23, 2016" (PDF). ^ "ARG POll February 19–20, 2016". ^ "Clinton Leads Sanders by 33%" (PDF). www.realclearpolitics.com/. Retrieved 20 February 2016. ^ a b "IMP/Target Insyght Poll: Clinton Dominates Dem Primary". insidemichiganpolitics.com. Retrieved 2016-02-08. ^ "Hillary up 19 over Biden and Sanders". mrgmi.com/. Retrieved 2015-09-16. ^ "PPP MI" (PDF). publicpolicypolling.com. Retrieved 2015-07-09. ^ "Minnesota Poll Results: Presidential race". Star Tribune. January 23, 2016. ^ "Walker, Clinton Lead in Minnesota; General Closer than 2008 and 2012" (PDF). Retrieved 2015-08-04. ^ "Suffolk Marginals" (PDF). suffolk.edu. Retrieved 2015-07-09. ^ "PPP MN" (PDF). publicpolicypolling.com. Retrieved 2015-07-09. ^ "MISSISSIPPI 2016 PRESIDENTIAL PRIMARY SURVEY TOPLINES" (PDF). Retrieved 2016-03-02. ^ "Missouri Poll Results". RABA Research. Retrieved 11 March 2016. ^ "Missouri Poll Results". Fort Hayes State University. Retrieved 12 March 2016. ^ "Trump Up Big in Missouri; GOP Hopefuls Lead Clinton in State" (PDF). Public Policy Polling. Retrieved 2015-08-12. ^ "Gravis Insights Political Telephone Survey Montana". Gravismarketing.com. Retrieved 2015-07-09. ^ "Nevada Polling Results". Retrieved 2016-02-18. ^ "Nevada primary: CNN/ORC poll full results" (PDF). Retrieved 2016-02-17. ^ "Nevada Democratic Caucus Poll" (PDF). ^ "South Carolina, Nevada CNN polls find Clinton far ahead". Retrieved 2015-10-12. ^ "Nevada poll: Sandoval early favorite to succeed Reid; Cruz surges to lead pack with Walker". Gravismarketing.com. Retrieved 2015-07-09. ^ "American Research Group (2/6-2/7 2016)". The Huffington Post. ^ "UMass Lowell/7News Daily Tracking Poll of New Hampshire Voters Release 6 of 8" (PDF). University of Massachusetts Lowell Centre for Public Opinion. February 2016. Retrieved 6 February 2016. ^ Dyck, Joshua J. (January 2016). "UMass Lowell/7News Tracking Poll of New Hampshire Voters Release 1" (PDF). University of Massachusetts Lowell Center for Public Opinion. Retrieved 5 February 2016. ^ Agiesta, Jennifer; Director, CNN Polling (2016-01-31). "Before Iowa, New Hampshire backs Trump, Sanders". CNN. Retrieved 2016-02-01. ^ "NEW HAMPSHIRE – TRUMP COMFORTABLY AHEAD; BUSH SURGES TO SECOND, KASICH IN THIRD; SANDERS CRUISING AHEAD OF CLINTON" (PDF). Emerson College Polling Society. 27 January 2016. Retrieved 5 February 2016. ^ "New Hampshire". American Research Group, Inc. Retrieved 5 February 2016. ^ Myers, R. Kelly (25 January 2016). "Bernie Sanders has Re-Opened a Lead over Hillary Clinton in the Democratic Presidential Race in New Hampshire" (PDF). Franklin Pierce University; Boston Herald. Retrieved 5 February 2016. ^ "Fox News Poll: Sanders up by 22 points in New Hampshire". ^ "CBS News 2016 Battleground TrackerNew Hampshire". ^ "Final January 2016 NH DEM Study" (PDF). Suffolk.edu. Retrieved 2016-01-23. ^ a b "New Hampshire Democratic Presidential Preference Primary". Americanresearchgroup.com. Retrieved 2016-01-19. ^ "New Hampshire Polling Results" (PDF). Retrieved 22 January 2016. ^ "CNN and WMUR Poll". CNN. Retrieved 2016-01-19. ^ "New Hampshire: Sanders takes control" (PDF). monmouth.edu. Retrieved 2016-01-12. ^ "Fox News Poll: New Hampshire presidential primary races". foxnews.com. Retrieved 2016-01-08. ^ "CBS News 2016 Battleground Tracker New Hampshire" (PDF). ^ "Boston Herald poll article". ^ "CNN and WMUR Poll" (PDF). CNN. Retrieved December 9, 2015. ^ "PPP NH poll" (PDF). ^ "Fox News Poll: Trump, Sanders lead respective primaries in New Hampshire". Fox News. ^ "Current New Hampshire Polling". Gravis. ^ "New Hampshire: Clinton Pulls Ahead of Sanders" (PDF). Monmouth University Poll. 3 November 2015. Retrieved 22 January 2016. ^ "No Groundswell for Biden in New Hampshire: Bloomberg Politics/Saint Anselm Poll". ^ "Franklin Pierce-Herald poll: Sanders keeps lead over Clinton". bostonherald.com/. ^ "Full results of Suffolk University/Boston Globe poll". BostonGlobe.com. ^ "Latest NH Republican and Democratic Poll Results". Gravis. ^ "NBC News/WSJ/Marist Poll October 2015 New Hampshire Questionnaire". Retrieved 2015-10-04. ^ "Hillary Clinton trails Sanders in New Hampshire, even without Joe Biden in the race". New Hampshire Results. CNN. Retrieved 2015-09-24. ^ "WBUR Poll New Hampshire 2016 Democratic Primary" (PDF). WBUR. Retrieved 22 January 2016. ^ "New Hampshire: Sanders Leads Clinton by 7" (PDF). Monmouth University Poll. 15 September 2015. Retrieved 22 January 2015. ^ a b Will Jordan. "Sanders up big in New Hampshire and Iowa; Carson trails Trump". YouGov. ^ "NBC News/Marist Poll – September 2015 – New Hampshire Questionnaire". Retrieved 2015-09-06. ^ "Trump Way Ahead in New Hampshire; Sanders Leads Clinton" (PDF). Retrieved 2015-08-25. ^ "Bernie Sanders surges ahead of Hillary Clinton in N.H., 44-37". Retrieved 2015-08-11. ^ "Clinton in Jeopardy of Losing New Hampshire to Sanders". New Hampshire Results. PR Newswire. Retrieved 2015-08-05. ^ "Sanders keeping pace with Clinton in New Hampshire" (PDF). New Hampshire Results. WMUR. Retrieved 2015-08-04. ^ "New Hampshire Results" (PDF). NBC News/Marist. Retrieved 2015-07-26. ^ "WMUR Dem poll" (PDF). wmur.com. Retrieved 2015-07-09. ^ "CBS News 2016 Battleground Tracker New Jersey". CBS. Retrieved June 6, 2016. ^ "New Jersey 2016 Primary Forecasts". ARG. Retrieved June 7, 2016. ^ "IT'S BLUE JERSEY AS CLINTON OR SANDERS TOP TRUMP, QUINNIPIAC UNIVERSITY POLL FINDS; CLINTON TOPS SANDERS AMONG DEMOCRATS" (PDF). Quinnipiac. Retrieved May 19, 2016. ^ "NEW JERSEY: CLINTON HOLDS HUGE PRIMARY EDGE" (PDF). Monmouth. Retrieved May 4, 2016. ^ "OVER HALF OF NJ REPUBLICANS CHOOSE TRUMP; CLINTON STILL LEADS BUT LOSING GROUND AGAINST SANDERS". Eagletonpoll.rutgers.edu. Retrieved 2016-04-18. ^ "TRUMP, CLINTON CONTINUE TO HOLD COMMANDING LEADS IN NEW JERSEY; RUBIO A DISTANT SECOND IN GOP RACE". Eagletonpoll.rutgers.edu. Retrieved 2016-02-24. ^ "CHRISTIE'S JOB APPROVAL HITS NEW LOW, RATINGS ACROSS THE BOARD CONTINUE TO SLIP; TRUMP STILL LEADS 2016 GOP FIELD IN NEW JERSEY, CHRISTIE RECLAIMS SECOND". Eagletonpoll.rutgers.edu. Retrieved 2016-02-25. ^ "151117". View2.fdu.edu. 2015-11-17. Retrieved 2016-01-23. ^ "Trump Still Leads Gop Field In New Jersey, Christie Falls Well Behind; Voters To Christie: End Campaign | Center For Public Interest Polling". Eagletonpoll.rutgers.edu. 2015-10-15. Retrieved 2016-01-23. ^ "2016 Candidates Polarize NJ Voters :: Fairleigh Dickinson University PublicMind Poll". Publicmind.fdu.edu. Retrieved 2015-07-09. ^ "NEW MEXICO DEMOCRATIC PRIMARY LIKELY VOTER SURVEY PRESIDENTIAL PRIMARY RACE". BWD Global. May 30, 2016. Retrieved June 5, 2016. ^ "Journal Poll: Clinton leads among NM Dems". ^ "Clinton and Trump Poised to Regain Momentum in the Empire State; NY Looks Safe For Dems In General" (PDF). Retrieved 2016-04-18. ^ "Clinton Protects Big Lead Over Sanders in NY: NBC4/WSJ/Marist Poll". Retrieved 2016-04-14. ^ "Black Votes Matter for Clinton in New York, Quinnipiac University Poll Finds; Trump Sweeps All Groups Against Cruz or Kasich" (PDF). Retrieved 2016-04-12. ^ "New York Polling Results". 17 April 2016. ^ "Bernie Narrows Gap; Hillary Still Leads By 10 Points; Trump Maintains Huge Lead, Kasich 2nd, Cruz 3rd" (PDF). Retrieved 2016-04-13. ^ "New York: Clinton Leads by 12" (PDF). Retrieved 2016-04-11. ^ "New York Hates Ted Cruz; Trump, Clinton Lead Big" (PDF). Retrieved 2016-04-15. ^ "NBC News/WSJ/Marist Poll April 2016 New York Questionnaire" (PDF). Retrieved 2016-04-11. ^ "NY1/Baruch College Poll: Trump Leads Rivals by 43 Percentage Points". Retrieved 2016-04-15. ^ "Clinton and Trump Lose Ground in NY, but Still in Control; Voters Weigh in on Open-Conventions". Retrieved 2016-04-08. ^ "Fox News Poll: Trump, Clinton rule Empire State". Retrieved 2016-04-10. ^ "CBS News 2016 Battleground TrackerNew York". Retrieved 2016-04-03. ^ "Clinton, Trump Have Big Leads in New York Primaries, Quinnipiac Poll Finds; Adopted Daughter Thumps Native Son, Edges Kasich" (PDF). Retrieved 2016-03-31. ^ "Emerson Poll: Trump, Clinton Trouncing Their Rivals in New York; In General Election, Hillary and Bernie Lead The Donald" (PDF). ^ "Quinnipiac NY poll" (PDF). quinnipiac.edu. Retrieved 2015-07-09. ^ "Trump, Clinton Continue To Lead By Double Digits in NC" (PDF). ^ High Point University. "HPU Poll: Clinton Leads Democratic Primary; Trump, Cruz and Rubio Have Most GOP Support". High Point University. ^ "Trump Keeps Gaining in NC; Clinton Maintains Huge Lead" (PDF). Public Policy Polling. 20 January 2016. Retrieved 22 January 2016. ^ Dowdy, Demi (27 January 2016). "Civitas Poll: Clinton Maintains Strong Lead among NC Democrats". Civitas Institute. Retrieved 5 February 2016. ^ "PPP NC poll" (PDF). ^ "Presidential Primary Poll October 29 – November 2, 2015" (PDF). Elon University. Retrieved 22 January 2016. ^ "Clinton rising in North Carolina; Trump still leads" (PDF). Public Policy Polling. 27 October 2015. Retrieved 22 January 2016. ^ "Trump Steady in North Carolina; Biden Polls Well" (PDF). www.publicpolicypolling.com. Retrieved 2015-09-30. ^ "Elon University Presidential Primary Poll September 17–21, 2015" (PDF). www.elon.edu. Retrieved 2015-09-24. ^ "Trump Continues to Grow in North Carolina; Dem Race Steady" (PDF). www.publicpolicypolling.com. Retrieved 2015-08-20. ^ "PPP NC" (PDF). publicpolicypolling.com. Retrieved 2015-07-09. ^ "ARG Ohio Poll March 12-13, 2016". ^ "OHIO: KASICH, TRUMP IN GOP SQUEAKER; CLINTON LEADS IN DEM RACE" (PDF). ^ "2016 Presidential Swing State Polls Poll – October 7, 2015 – Biden, Carson Are Hot In Flori | Quinnipiac University Connecticut". Quinnipiac.edu. 2015-10-07. Retrieved 2016-01-23. ^ a b "Quinnipiac poll" (PDF). quinnipiac.edu. Retrieved 2015-07-09. ^ "Monmouth University Poll" (PDF). ^ "News9/Newson6: Sanders Closes Gap, But Still Trails Clinton In OK". ^ Silas Allen. "Poll shows Democratic primary race tightening in Oklahoma". ^ Madison Grady. "SoonerPoll: Clinton remains frontrunner, but Sanders continues to rise". ^ "EXCLUSIVE POLL: Trump, Clinton Remain Front-runners in Oklahoma". November 20, 2015. ^ "Poll: Ben Carson leads Republican presidential field in Oklahoma". Retrieved 2015-10-29. ^ "Poll: Despite Bernie Sanders' Crowds, Hillary Clinton Ahead In Oregon". May 10, 2016. Retrieved May 11, 2016. ^ "In City of Portland, Oregon: Ted Wheeler Is Overwhelming Favorite to Win Mayoral Primary; But Will He Avoid an 11/08/16 Runoff?". Retrieved 2016-04-02. ^ "Oregon presidential poll: Hillary Clinton pressed by Bernie Sanders; Donald Trump leads GOP field". Retrieved 2015-08-06. ^ "Pennsylvania Democratic Presidential Primary Poll 4/25/16" (PDF). Opinion Savvy. April 25, 2016. Retrieved April 25, 2016. ^ "Pennsylvania Democratic Presidential Primary Poll" (PDF). CPEC LLC. April 26, 2016. Retrieved April 26, 2016. ^ "2016 Pennsylvania Democratic Presidential Primary - Clinton 58%, Sanders 38% (ARG 4/21-4/24)". American Research Group. April 26, 2016. Retrieved April 26, 2016. ^ "Pennsylvania Democratic Primary Poll". Harper Polling. April 26, 2016. Retrieved April 26, 2016. ^ "Trump and Clinton Hold Strong Leads in Pennsylvania, New Poll Shows". Retrieved 2016-04-24. ^ "PENNSYLVANIA: CLINTON LEADS SANDERS BY 13" (PDF). Retrieved 2016-04-20. ^ "April 2016 Franklin & Marshall College Poll" (PDF). Retrieved 2016-04-21. ^ "Fox News Poll: Trump holds huge lead in Pennsylvania, Clinton up over Sanders". Retrieved 2016-04-10. ^ "Pennsylvania Quinnipiac University Poll March 30-April 4, 2016" (PDF). Retrieved 2016-04-06. ^ "Pennsylvania Democratic Primary Poll April 2-3, 2016". Retrieved 2016-04-05. ^ "March 2016 Franklin & Marshall College Poll" (PDF). Retrieved 2016-03-24. ^ "PENNSYLVANIA STATEWIDE POLL REPUBLICAN AND DEMOCRATIC PRIMARIES". ^ "Franklin & Marshall February 13–21, 2016" (PDF). ^ "2016 Pennsylvania Democratic Presidential Primary – Clinton 48%, Sanders 41% (Robert Morris University 2/11-2/16)". ^ Field, Nick. "Harper Poll: Clinton 55% Sanders 28%". Politics PA. Retrieved 5 February 2016. ^ "January 2016 Franklin & Marshall College Poll" (PDF). Franklin & Martin. 28 January 2016. Retrieved 5 February 2016. ^ "Franklin and Marshall College Poll: Survey of Pennsylvanians Summary of Findings" (PDF). Franklin & Marshall. 29 October 2015. Retrieved 22 January 2016. ^ "Taubman Center poll: Clinton, Trump lead in Rhode Island, but many voters undecided". Retrieved 2016-04-24. ^ a b "Statewide Presidential primary poll: Trump strong, Clinton rising". Taubman Center for American Politics and Policy. Retrieved 1 March 2016. ^ "Clemson University Palmetto Poll Democratic primary summary". Retrieved 2016-02-26. ^ "EMERSON POLL: CLINTON LEADS SANDERS BY A WIDE MARGIN IN SOUTH CAROLINA, WITH STRONG SUPPORT FROM AFRICAN AMERICANS" (PDF). Retrieved 2016-02-26. ^ "Donald Trump's Lead Slashed in South Carolina: Poll". Retrieved 2016-02-19. ^ "Clinton Strong in South Carolina But Warning Signs Ahead, Bloomberg Poll Shows". Retrieved 2016-02-18. ^ "South Carolina primary: ARG Poll". Retrieved 2016-02-17. ^ "South Carolina primary: CNN/ORC poll full results". Retrieved 2016-02-16. ^ "OANN/Gravis South Carolina Polling Results February 2016". OANN. February 15, 2016. Retrieved February 15, 2016. ^ "CBS News 2016 Battleground Tracker South Carolina" (PDF). CBS News. February 14, 2016. Retrieved February 14, 2016. ^ "NBC News/WSJ/Marist Poll January 2016 South Carolina Questionnaire" (PDF). Retrieved 5 February 2016. ^ "CBS News 2016 Battleground Tracker South Carolina" (PDF). CBS News. January 24, 2016. Retrieved January 24, 2016. ^ "CBS News 2016 Battleground Tracker South Carolina" (PDF). ^ "Trump Still Leads But Declining in SC; Clinton Dominant" (PDF). Public Policy Polling. 10 November 2015. Retrieved 22 January 2016. ^ "South Carolina: Clinton with Big Lead" (PDF). Monmouth University Poll. 10 November 2015. Retrieved 22 January 2015. ^ "Winthrop University: Winthrop Poll – Current Findings". winthrop.edu. ^ "PDF file" (PDF). Retrieved 2015-10-12. ^ "SC Poll". Retrieved 2015-11-05. ^ "CNN SC poll". Retrieved 2015-11-05. ^ "The Buzz". Retrieved 2015-10-01. ^ "The Buzz". Retrieved 2015-09-09. ^ "SC polling" (PDF). Retrieved 2015-08-04. ^ "Morning Consult SC" (PDF). morningconsult.com. Retrieved 2015-07-09. ^ "Hillary Clinton Leads Sanders By 3 in South Dakota on Strength with Women and Registered Democrats" (PDF). Targeted Persuasion. Retrieved June 4, 2016. ^ "Polls: Trump, Clinton Ahead in Super Tuesday States". ^ "Carson leads the presidential field in Tennessee, but many still unsure, and more oppose than favor other top candidates". mtsupoll.org. ^ "Texas Democratic Presidential Primary". ^ "CBS News 2016 Battleground TrackerTexas". ^ "TEXAS: CRUZ, CLINTON LEAD PRIMARIES" (PDF). ^ "2016 Texas Republican Presidential Primary – Cruz 29%, Trump 28% (Emerson College Polling Society 2/21-2/23)" (PDF). ^ "Cruz Increases Lead In TX Against Trump In KTVT-CBS 11 / Dixie Strategies Poll". ^ "Results of SurveyUSA Election Poll #22696" (PDF). ^ "Cruz, Clinton still lead in Texas". ^ Ramsey, Ross. "UT/TT Poll: Clinton Still Leads in Texas, But Margin Has Narrowed, by Ross Ramsey". The Texas Tribune. Retrieved 2016-02-23. ^ "Texas Statewide Survey" (PDF). University of Texas / Texas Tribune. Retrieved 22 January 2016. ^ "Carson Leads Trump Slightly In Texas KTVT-CBS 11 Dixie Strategies Poll". cbslocal.com. ^ "Texas Lyceum Poll Results: 2015 Texas Statewide Survey" (PDF). texaslyceum.org. Retrieved 2015-10-01. ^ "TX Tribune" (PDF). amazonaws.com. Retrieved 2015-07-09. ^ "Texas Statewide Survey" (PDF). Retrieved 22 January 2016. ^ Lisa Riley Roche. "Cruz, Sanders top picks in Tuesday's Utah caucuses, poll says". ksl.com. ^ Lisa Riley Roche. "Cruz, Sanders are Utahns' pick for president; Trump announces Utah organization". desertnews.com. ^ Lee Davidson. "Poll: 4-way tie among GOP presidential candidates in Utah". sltrib.com. ^ Bryan Schott. "Poll Shows Sanders Leads the Democratic Field Overall in Utah; Utah Democrats Back Clinton". utahpolicy.com. ^ "Carson, Sanders Top Picks Among Utahns for 2016". Retrieved 2015-09-21. ^ "Utahns Still Mostly Undecided on Presidential Field; Bush and Clinton in the Lead". Retrieved 2015-08-15. ^ Schott, Bryan. "Bush, Clinton are Frontrunners for 2016 Nomination Among Utahns". Retrieved 2015-07-09. ^ "Subject: The VPR Poll: The Races, The Issues And The Full Results". ^ "Poll: Bernie Sanders popular in Vt., even among Republicans · Castleton College". Wcax.com. Retrieved 2015-09-18. ^ "Vermont Election Poll – 2014". Castleton.edu. Retrieved 2015-07-10. ^ "CBS News 2016 Battleground TrackerVirginia". Retrieved 2016-02-28. ^ "VIRGINIA: TRUMP, CLINTON LEAD PRIMARIES" (PDF). ^ "RC Poll: Clinton, Trump hold leads in Virginia primary elections; Cruz, Rubio in tight battle for second". ^ "Trump leads GOP field, with Rubio and Cruz next; Clinton leads Sanders among Virginia Democrats" (PDF). ^ "VIRGINIA SURVEY 2015" (PDF). umw.edu. Retrieved 2015-11-17. ^ "Clinton top choice among Virginia Democrats, but Biden performs better against Republicans" (PDF). Cnu.edu. Retrieved 2015-10-12. ^ "Bush leads GOP Field in Virginia Poll" (PDF). Public Policy Polling. Retrieved 2015-07-16. ^ "Bush tops Clinton in battleground Virginia; Republican 2016 field still largely wide open, while Democrats rally strongly around Clinton" (PDF). Cnu.edu. Retrieved 2015-07-11. ^ "Washington State poll: Paul leads GOP field, Murray leads McMorris Rodgers; Right to Work up 45% to 33% – Gravis". Gravismarketing.com. Retrieved 2015-07-09. ^ "PPP WA" (PDF). publicpolicypolling.com. Retrieved 2015-07-09. ^ "Overwhelming support for Trump, small lead for Sanders in MetroNews West Virginia Poll". MetroNews. Retrieved 6 May 2016. ^ "Trump, Sanders lead in West Virginia (april 2016)" (PDF). Scribd. Retrieved 3 May 2016. ^ "WV-Gov Thirty-Ninth Street Strategies for West Virginia Veterans (March 2016)". Scribd. Retrieved 21 April 2016. ^ "Poll: WV prefers GOP for president, Democrat for governor". wvgazettemail.com. Retrieved 2016-02-29. ^ "Trump and Sanders Have Big Leads in MetroNews West Virginia Poll" (PDF). wvmetronews.com. 22 February 2016. Retrieved 2016-02-22. ^ "Survey: WV residents likely to pick Trump over Clinton in 2016". Statejournal.com. Retrieved 2015-08-27. ^ "Trump leads Republican field and Clinton in West Virginia, according to new Orion Strategies statewide poll". prnewswire.com. 26 August 2015. ^ "Poll: Democrats running for WV gov locked in dead heat". Wvgazettemail.com/. Retrieved 2015-08-26. ^ "ARC Wisconsin Poll April 1-3, 2016". Retrieved 2016-04-04. ^ "Wisconsin Feels the Bern While Cruz has Momentum Going into Primaries" (PDF). Retrieved 2016-04-04. ^ "CBS News 2016 Battleground TrackerWisconsin". Retrieved 2016-04-03. ^ "FOX Business Network Poll: Sanders Tops Clinton by Five in Wisconsin". Retrieved 2016-03-31. ^ "Loras College Poll finds Cruz tops Trump, Clinton leads Sanders, tight race for state supreme court in Wisconsin". Retrieved 2016-04-02. ^ "Sanders leads in Wisconsin; GOP Race Close; VA Privatization Issue Hurts Johnson" (PDF). Retrieved 2016-03-31. ^ "Marquette Law School Poll – March 24-28, 2016" (PDF). Retrieved 2016-03-30. ^ "EMERSON POLL: WISCONSIN PRIMARY IN PLAY FOR BOTH PARTIES; CRUZ LEADS TRUMP BY A POINT; CLINTON UP 6 OVER SANDERS; CRUZ FARES BETTER THAN TRUMP IN GENERAL AGAINST CLINTON" (PDF). Retrieved 2016-03-24. ^ "@MULawPoll: In Dem prez race in WI, it's Sanders 44%, Clinton 43%. In @mulawpoll in January, it was Clinton 45%, Sanders 43%. #mulawpoll". Twitter. February 25, 2016. Retrieved February 25, 2016. ^ "For Democrats in WI: Hillary Clinton 45%, Bernie Sanders 43%, Martin O'Malley 1% among those intending to vote". Twitter. January 28, 2016. Retrieved February 5, 2016. ^ "New Marquette Law School Poll finds Carson, Trump and Rubio atop tight Wisconsin GOP primary race". ^ "The Wisconsin Survey fall 2015 | The Wisconsin Survey fall 2015" (PDF). Retrieved 2015-10-21. ^ "Marquette Law School Poll finds Walker job approval at 37 percent, following presidential run | Marquette Law School Poll". law.marquette.edu. Retrieved 2015-09-30. ^ "Marquette Law School Poll finds Walker, Clinton leading primary fields among Wisconsin voters | Marquette Law School Poll". law.marquette.edu. Retrieved 2015-08-20. ^ "Marquette Law School Poll finds Walker job approval down | Marquette Law School Poll". law.marquette.edu. Retrieved 2015-07-09. ^ "2016 Elections Puerto Rico Poll". PDF. Retrieved June 5, 2016.